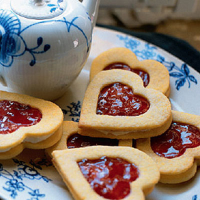 Pass the biscuits and settle down with a cuppa. After all, there’s nothing nicer when you need a break. Especially when the biscuits are home-baked and just like Granny used to make. Put the flour and 200g of the butter in a food processor and blend until the mixture starts to resemble breadcrumbs. Add 100g of the icing sugar, the egg yolks and vanilla and blend to form a smooth dough. (Alternatively, rub the butter into the flour in a bowl and then mix in the sugar, egg yolks and vanilla to form a dough.) Wrap and chill for 1 hour. Preheat the oven to 200°C, gas mark 6. Grease 2 large baking sheets. Thinly roll out half the dough on a floured surface and cut out 24 heart shapes, using a cutter measuring about 5.5cm (from point to point). Space slightly apart on one of the baking sheets. Roll out the remaining dough and cut out 24 more heart shapes, place on the second baking sheet and cut out a smaller heart (approx 3cm from point to point) from the centre of each. Bake in the oven for about 8-10 minutes until pale golden around the edges. Leave on the baking sheets for 5 minutes, then transfer to a wire rack to cool. Beat the remaining butter in a bowl with the remaining icing sugar and 1 tsp boiling water until pale and creamy. Using a small palette knife, spread the buttercream over the solid biscuit shapes and spread the centre of each with a little conserve. Top with the remaining biscuits. Store, unfilled, in an airtight box and sandwich with buttercream when ready to serve.